My sister Barbara was 10 years old and my sister Janis was 8 years old when I was born. Since my parents were both in their late 30s at the time, clearly I was an accident. Nevertheless, in some fashion, my sisters delighted in having a new baby brother. One such delight was the annual 4th of July parade that many small towns had every year. Our little town was no exception, almost to the point of strangeness. Anyone that wanted to could march in the 4th of July parade. It wasn’t like today where only major high school bands, businesses, floats, or fire trucks can participate. Everyone delighted in dressing up whatever vehicle they had to celebrate the day. After all, the Republic was only 175 years old and these things had to be celebrated. As near as I can tell, my family never participated before July 1951. My sisters now had an excuse to dress up and show off their new baby brother, and they spent countless hours designing and making a suitable costume for me in that wonderful parade beginning with a simple stroller for a 9-month-old boy. As you can see however, the result of the vehicle and its only occupant were the result of the imaginings of two young Girl Scouts. The years went by and there were always the stories about that “adorable” little boy in the parade so long ago. Moreover, as the parades began and ended, so too did the rules of the parade. I am told that it became important to encourage people to participate and so a Grandstand was constructed and prizes were invented. 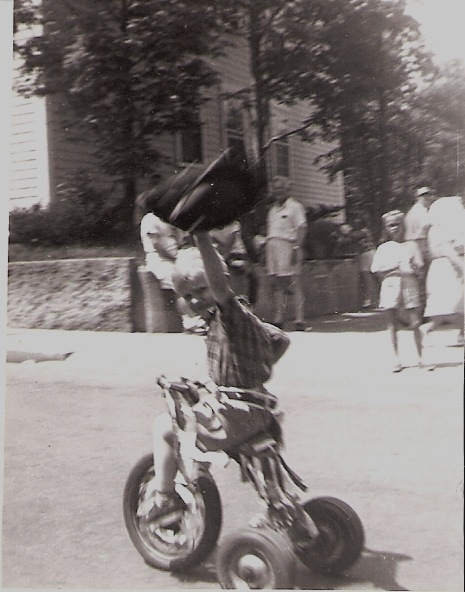 A little boy, now 4 years 9 months, was to be in the 1955 parade. My sisters were not as enthusiastic about showing me off as they once had been. Now 15 and 13 they were on to other interests that no doubt included boys their own age and the burgeoning rock-and-roll music that was just then appearing on the scene. However, they did help with the decorating of my little tricycle. For my part, I had discovered Roy Rodgers, Hopalong Cassidy, The Lone Ranger, and the Cisco Kid. There was nothing better than “good vs. evil” and I had my favorites all picked out. I had my cowboy hat, my fancy holster, and toy six-guns, and I was ready. I don’t remember much of the parade except the ending at the grandstand. I thought it would be a good idea to take off my cowboy hat and wave to the crowd and to the members on the grandstand. They awarded me a $5 prize for being the cutest kid in the parade, or some such made up thing. For many years, afterward I was the subject of 4th of July legend. There are few people alive today who would remember it, but occasionally I still hear a reference to the cute towhead kid in the parade. This episode, and the subsequent notoriety that forever followed, seemed to end my sister’s need to show off their baby brother. They were in their teens and their 4-year-old brother had shown them up big time! 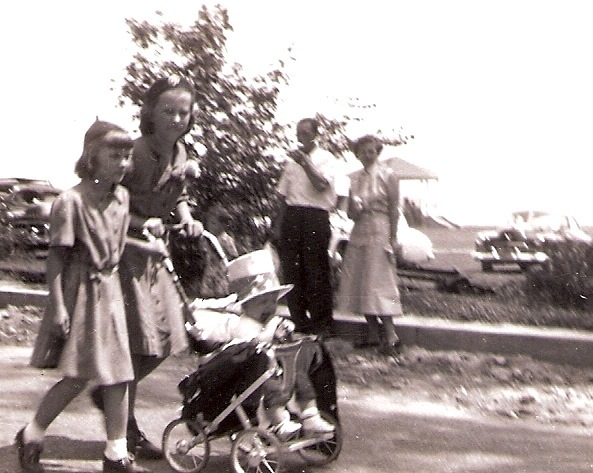 At their ages, they didn’t need the competition and I don’t remember ever participating in another 4th of July parade. Gallery | This entry was posted in Humor, Storytelling and tagged character, childhood, essay, family, General, humor, learning, Life, literature, non-fiction, perseverance, persistence, Storytelling, WPlongform. Bookmark the permalink. Written snapshots for your children. Fine idea. I enjoy different approaches to memoir as I explore similar ideas and themes myself, both at Lonely Keyboards and Vinyl Connection. Hope to find time to work through (at least some of!) your archive, JT. Hi J T Weaver. great Memory. Thank you for liking my poem Encounter! Peace and Best Wishes. The Foureyed Poet. You’re welcome. You create great visuals. It’s something I admire. Everything happens for a reason(s). I am convinced that the human condition is to share and to attempt understanding. Thus, stories. Thanks for telling them…both the cute and the not so cute. 🙂 Hats off to you, cowboy! Accidents happen for a reason. You are a talented writer and you are leaving a great legacy not only for your children but an expanded audience as well. Thanks Frances. I’ve changed a lot in the 58 years since then. As much as I’d like to answer your question about my sisters, you’ll just have to click the book cover to find out. Sorry. My youngest brother is 10 years old than me as well. I remember being both doted on and pushed away. Nice story! Thanks Jean. I really appreciate it. Ah, what a little cutie pie! That’s what comes of being the youngest in the family – my younger sister was definitely the cute one in our household. Not that it seems my dad, at least, ever really noticed – when I asked him to dig out a baby pic for a recent “identify the baby” quiz at work, he sent through a photo of my blonde, curly haired sister, instead of brown, straight-haired me. Oh well. Thank you very much. I’m glad you enjoyed the story. Good story! Your blog’s theme is a wonderful idea. Thank you very much. I hope you enjoy the stories until Wednesday or the book after that. Thanks. I hope you enjoy the stories. What a delightful childhood story! When I was born, my brother was nearly ten and he and my big sister liked to take me out in my pushchair. The problem was that he used to hijack the pushchair and career down the street, taking the corners on two wheels, while my sister was left in tears, imagining that baby would meet her end. It wasn’t long before he was banned! Thank you very much. I hope you will enjoy all of them. Thank you very much Rachel. I hope you will continue with the rest of the stories in order. Kick back, relax, get a glass of wine, and enjoy. Wonderful! I love it when people can identify with the images. Glad you liked it. I dont know what happened to my first post here. I want to first say thanks. I looked at your page and thought, what is this guy doing connecting to my blog. I know now. I will be back here. Thank you very much and welcome to you! I am going to post my thoughts without reference to the other posts that I have read. I want to keep the responses unique. The first thing that stood out to me (a thing that we have in common) is the age difference between you and your sisters. Did you find it hard to relate to them on a regular basis? At the ending of this post, it seems like there was some resentment. Maybe resentment is the wrong word. Conflict might be a better word. I absolutely love the music from the 1950’s and 60’s. I am an eclectic music lover and The Blues… Nina Simone and ‘My Baby Just Cares For Me’… She had such presence. I could go on and on about the music. oh certainly. As I wrote, I was a Valentines Day accident. It was pre-birth control so those things happened more than today. And at first I think my sisters thought it was cool having me around but that wore off. They were teenagers after all – understandable. But I hardly knew them growing up. We were never all that close, although Janis and I are closer now than ever. Will life ever be that simple again? Or am I just seeing it from an adult’s perspective? Love your style, I could see it as if I had been there. Thank you very much. I really appreciate it. And no, those days are over David. There are some things that I could say are better (healthcare, internet, etc) but the simplicity of that life will never return. But my parents thought TV, rock-n-roll, and modern (then) cars had spoiled everything from when they were kids. Who know? I’m really glad you liked it though and I hope you’ll be able to read the whole story. I can imagine! And I suppose that was a good sum of money for that time. Do you remember what you did with it? Will do. Thanks for stopping by. I appreciate it. Big sisters can be like that! — it’s towhead. Tell me if you don’t want any of that stuff — but I thought you might like to know. Great post — I remember those parades, too! I hope — but I think I’m brown for a while now!